Join us for our latest fundraising adventure as we take on the Larapinta Trail with the Prostate Cancer Foundation of Australia (PCFA) to raise funds and awareness for prostate cancer research and the provision of Prostate Cancer Specialist Nurses. The mission of the PCFA is to reduce the impact of prostate cancer on Australian men, their partners and families, recognising the diversity of the Australian community. PCFA is working towards this goal by promoting and funding research, implementing advocacy, awareness and education programs and supporting men and their families who are affected by Prostate cancer. 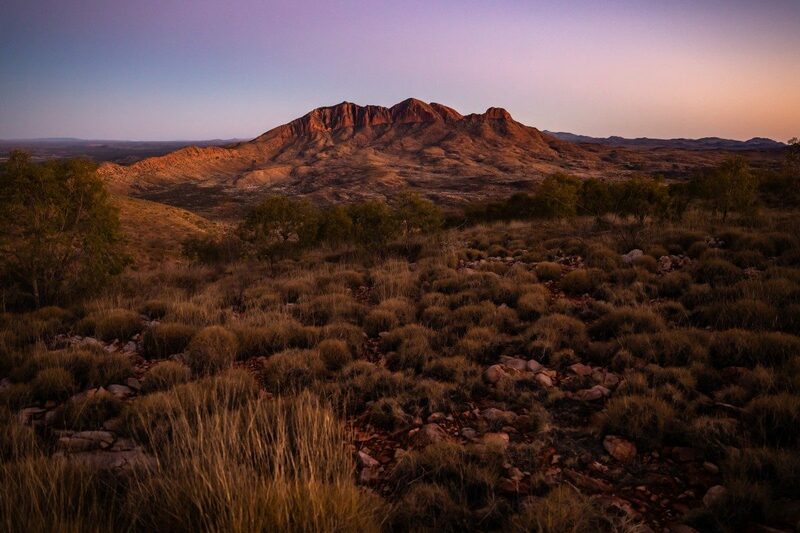 We will take an exclusive team over the Larapinta Trail from the 3-8 May 2019! This is a great opportunity to step outside your comfort zone and be part of something bigger. If you would like more information on this adventure, submit your expression of interest form. Download the full itinerary or book online if you are ready to #TrekForProstateCancer . Our day starts in Alice Springs at the Mercure Alice Springs Resort at 7.30am where you will meet your guides for a pre- tour briefing and head for a “Welcome to Country” before exploring famous Stanley Chasm. 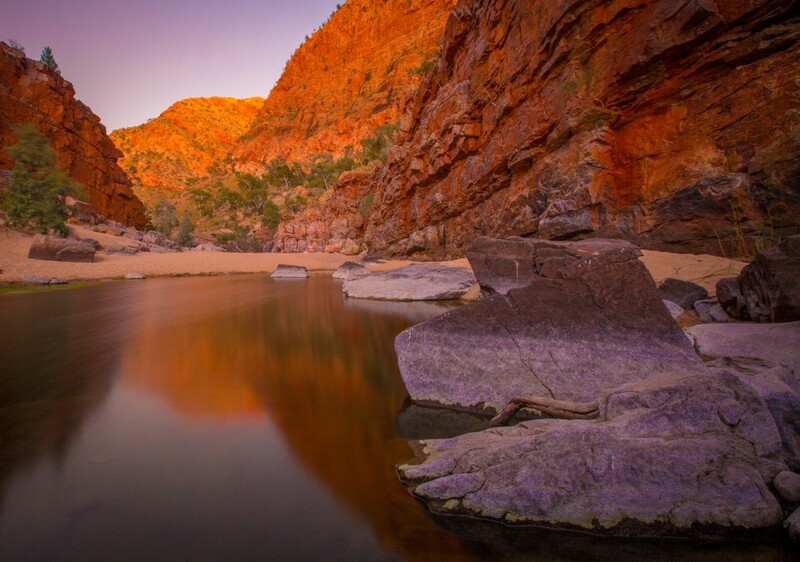 We travel to Ormiston Gorge which is one of the main highlights of the West MacDonnell Ranges National Park. Enjoy a beautiful and spectacular walk up to high escarpment overlooking the pound and then we descend into the pound for lunch. Make sure you pack your swimmers. The walk takes you through a spinifex covered landscape. You will be amazed with extensive population of wildlife surrounding the many waterholes along the way. Upstream as you walk through the gorge rising spectacularly on either side are cliff faces which look like Red Lego blocks. You will see ancient pines, river red gums and you may even see the famous Sturt Desert rose. We head to our campsite to find our stand up touring tents erected and your overnight bags waiting in your tent. Enjoy freshly brewed coffee and tea when you arrive. Relax as a delicious dinner served with Australian wine is prepared for your enjoyment. Sit around the campfire, toast marshmallows and chat about the day’s adventure with your new friends. We have carefully planned your journey so that the most challenging day to Mt Sonder (the highest point of the trail) is at the start of the tour when you are fresh and more energetic, then we gradually make each day easier as the tour comes to an end. We start the day early so we can enjoy a glorious walk to Mt Sonder. European’s were first acquainted with the mountain in the watercolour painting of the famous aboriginal artist Albert Namatjira. This section walk to the summit early to enjoy the best colours of the range and we return via the same trail. Further north you can see for hundreds of miles into the distance. Initially we climb through bushland the tree’s gradually become more stunted as the track rises on open spinifex covered slopes. The lookout has a can with a visitor’s book. We will enjoy on top sweeping views of where we have been and enjoy our achievements. The trip to the peak of Mount Sonder comprises an 8km walk from the gorge over rocky and steep terrain suited to fit bushwalkers. Note: For those not up to conquering Mount Sonder we o eranalternativeeasierwalkday. Today our walk will take us from the Ormiston Gorge to the Historic Glen Helen Homestead. Our walk starts with a magnificent Red Mallee forest, wildflowers after rains if you’re lucky and a dis-used cattle corral, which reminds us of the past pioneers of this rugged cattle country. Mount Sonder looming in the distance and plains stretching as far as the eye can see. We descend over gently undulating terrain when we come to the junction of Ormiston and Davenport creeks which is the start of the famous Finke River. The Finke was called Larapinta by the Arentee People which means salt creek and it is one of the oldest water courses on this planet. We cross the Finke River to the west bank and rise through a patch of river red gums to an open plain. An easy walk leads to the oasis of the Historic Glen Helen Homestead which is our accommodation for the next two nights. (pictured above right). This afternoon our guests will enjoy a scenic helicopter to see the dramatic landscapes from the air. Take in breathtaking vistas of the West MacDonnell Range, Glen Helen Gorge, Finke River, Ormiston Gorge, Mt Sonder and Gosse Bluff. A truly inspiring journey. There is also time to take a stroll along pretty Glen Helen Gorge for an insight on the history and ecology of this unique area or take a swim in the homestead pool. Tonight enjoy our group meets in the restaurant for an a-la-carte meal in the homestead. Modern cuisine with an Australian twist enjoy your choice of barramundi, lamb, pork, kangaroo and more with a glass of wine. Retire to your room with ensuite and reverse cycle air conditioning / heating. Today we walk section 8 of the Larapinta Trail. We climb to Eagles landing which in the Aboriginal dreamtime tells the story of an Eagle ancestor who patrolled the range from Ochre pits to Serpentine Gorge. After a morning tea stop at Eagles landing, we then continue to Counts Point. This vantage point offers a wonderful opportunity to see the overall geology of the ranges. Views along this straight Quartz ridge lines give a spectacular view of Mt Sonder. To the right in the distance is the highest peak in the Northern Territory Mt Zeil. In our opinion the best view along the whole length of the trail. After lunch we descend the range into the plains to the end of our days walk at Serpentine Gorge chalet. We then transfer back to our hotel accommodation at Glen Helen Homestead. to Inarlanga Pass. The Ochre pits are still used by the traditional land owners, Arrente people. The track follows high ground to some of the best views of the whole Larapinta trail. The gorge has been the ceremonial place and important watering point for the Western Arrente people for thousands of years. We walk the descent back through spinifex foothills over a low saddle through mulga back to our starting point. We travel back to Alice Springs the end of a fantastic journey. Pre-Adventure Strength and Conditioning Program prepared by our Aurora Exercise Physiologists specifically for this adventure – 8 weeks and 2 fully supervised sessions for Brisbane trekkers or our 12 week Remote Preparation Program for interstate trekkers. Overnight accommodation and dinner in Alice Springs the night before trek. Pack Free fully supported walk with your overnight luggage transported to the campsite & homestead. 2 nights camping at magnificent Ormiston Gorge centrally located so you can walk directly into camp on night one. All guests will stay in walk-in tents with off the ground beds complete with deluxe camping mattresses. 2 nights at historic Glen Helen Homestead with comfortable rooms with ensuites. And a refreshing pool you can take a dip after a day’s walking or walk down to the swimming hole. All meals including 4 dinners, 4 breakfasts and 5 lunches. On your last 2 nights at Glen Helen Homestead you will enjoy a la carte meals in the award-winning restaurant accompanied with fine wines and beer. Australian wine and refreshments will be served during dinner whilst camping. Fresh fruit and trail mix to enjoy during your walk. Boots and a small amount of personal trek clothing.